You may have heard about turmeric, the powerful Asian spice that is teeming with powerful properties, and may be interested in trying out the famous golden paste recipe for dogs. Native to southern Asia, turmeric has been used for thousands of years for its powerful medicinal properties. The benefits of turmeric are many, so much so that more and more dog owners are starting giving their dogs golden paste and many veterinarians are even starting to recommend its use. What are some of the benefits of using golden paste for dogs? Golden paste is known for strengthening a dog’s immune system and as a powerful antioxidant, it has beneficial anti-inflammatory effects. These anti inflammatory properties are much cherished, so much so that, turmeric has been nicknamed “Mother Nature’s best anti-inflammatory” and its use is particularly beneficial to dogs suffering from stiffness and arthritis, explains veterinarian Dr. Loretta. Even in the cancer department turmeric is known for being a superstar. Veterinarian Dr. Dressler, praises its qualities claiming to have been using it for his cancer patients and witnessing first-hand its powerful effects causing shrinkage of many cancerous and non-cancerous growths in dogs. 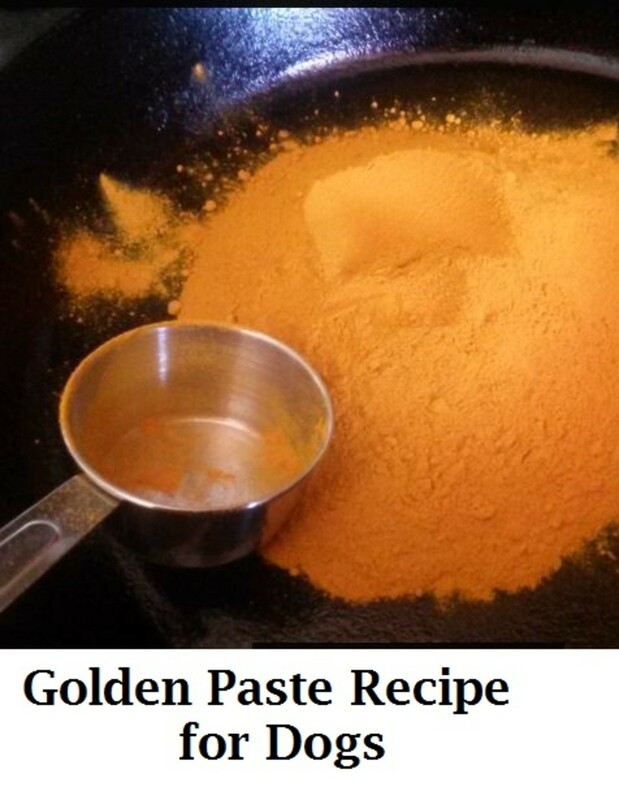 If you are interested in using golden paste or turmeric in general, it’s always best to consult with your vet first. Turmeric may interfere with certain medications like nonsteroidal anti-inflammatory drugs, and might not be the best option for dogs suffering from certain medical conditions such as gallbladder disease, diabetes mellitus, gastroesophageal reflux disease, hormone-sensitive tumors and iron absorption problems, explains veterinarian Susan G. Wynn. If your dog needs to have surgery, make sure to tell your vet you have been giving golden paste as turmeric can slow down blood clotting times. In a saucepan, mix turmeric powder with 1 cup water and allow it to boil. Lower the heat and allow the mixture to cook for about 8 to 10 minutes stirring often to prevent sticking. At some point, you will find that you will need to add some more water. Add enough water so to attain a nice paste consistency. Remove from heat and add the organic coconut oil and stir. Some people like to add the pepper right away, but we have found it is best to just grind the pepper fresh with a twist or two of the pepper grinder when the dose of turmeric is being served. Let the mixture cool down and save in the refrigerator for up 2 weeks. Generally, dosages vary from a ¼ teaspoon to 1 tablespoon added to food daily, but dosages may vary depending on the size of the dog and its underlying condition being treated. I’ve been using golden paste topically with my bulldog for pyoderma outbreaks (we think allergy related as it always seems to come with the start of summer). The antibiotic cream prescribed seems no longer effective so I tried GP(applying a thick layer and bandaging overnight to stop him licking it off) and it seems to be working well. Even after just one night the swelling was down greatly and there is much less pus present. Thank you for sharing. Who knew Tumeric was going to help with so many diseases that affect our pets. My dogs back legs became limp as recent as 4 days ago and now she drags herself across the floor to potty and pee. Hopefully, this turmeric recipe will improve her mobility and she can regain the usage of her back legs. I’m happy to learn that this recipe will also help her with her yeast infection. My girl is only 35 days short of turning 4 yrs.old. She’s an American Staffordshire Pitbull terrier. Hopefully, this recipe will work for her.